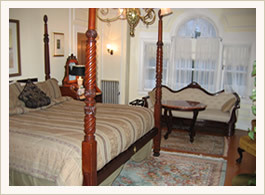 Furnished with a king size plantation mahogany bed and private marble bath with original Victorian tile. Elegant turn of the century furnishings from historic paneled lamps to comfortable sofas and winged chair make this room one of the inn's most requested room. Once the master bedroom of the house this also boasts of eight feet palladian windows.